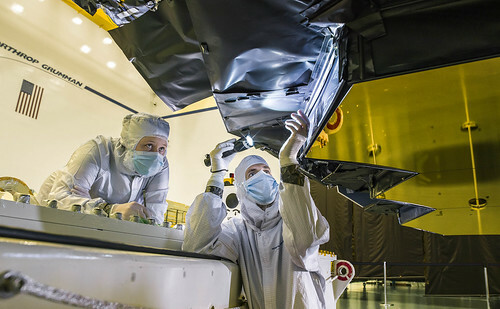 NASA’s James Webb Space Telescope isn’t covered by a protective tube like Hubble, instead technicians and engineers designed innovative shielding behind the primary mirrors — to keep out excess light. Northrop Grumman blanket technician Ann Meyer and Ball Aerospace optical engineer Larkin Carey inspect the protective barrier behind Webb’s primary mirror. This lightweight blanketing plays an important role on the observatory as it blocks undesirable light from reaching the telescope’s sensitive infrared sensors.